BLACKSBURG, Va., May 17, 2005 – Peizhen Kathy Lu, assistant professor of materials science and engineering at Virginia Tech, has been awarded a Ralph E. Powe Junior Faculty Enhancement Award from Oak Ridge Associated Universities to advance her research to add electrical conductivity to ceramic materials by incorporating carbon nanotubes. The Powe award provides seed money of $5,000 to faculty members who are in the first two years of their tenure track as an investment in promising achievements in an important area. The institution matches the award. Ceramics, which have high strength and superior wear resistance, are used as cutting tools, energy and high-temperature materials, biomedical devices, aerospace components, and armor. The lightweight, high performance material could be even more valuable if it could be more easily processed and could conduct electricity. Lu believes she has a way to create advanced ceramic materials by incorporating carbon nanotubes. Lu works with nanopowders â€“ particles smaller than 100 nanometers, or 100 times smaller than can be seen with the naked eye. "Such powder is very fluffy. Apparent density is only 5 percent," Lu said. "It takes tremendous force to create a component. Instead, we put the nanopowder in water and add dispersant to keep the fine particles evenly suspended and in close contact. Currently we are able to achieve 40 percent density." Materials science and engineering graduate student Chris Kessler has been working on the project since August 2004 and is characterizing the dispersant-treated ceramic suspensions and formed components. The carbon nanotubes are pure carbon structures much thinner but also much longer than the ceramic nanopowders Lu is working with. They have tensile strength 100 times that of steel but at 25 percent of the weight of steel. Lu is working with single-wall carbon nanotubes and is building collaborations with Larry Allard of the High Temperature Materials Laboratory and Alex Puretzky of the Center for Nanophase Materials Sciences at Oak Ridge National Laboratory. "Oak Ridge has the expertise in creating single wall carbon nanotubes with high purity and consistent well-defined shape," Lu said. Carbon nanotubes have been well dispersed in polymers, but not in ceramic composites. Lu believes she can be successful by mixing the ceramic powders, carbon nanotubes, and a dispersant in solution, using an electrosteric process to stabilize the attraction between the tubes and particles, then freeze casting the resulting homogeneous dispersion to form a solid material. Lu is an expert in powder material processing and sintering, which is a process for bonding materials by heating them to a temperature below melting so the surfaces of adjacent particles bond. "Another advantage of our process is we can make many shapes, including quite complex shapes, without using expensive dies," she said. Lu will explore the mechanism of interaction in different solution systems with physically different nanostructures and will refine the casting and drying processes for different shapes, density, and material characteristics. The freeze-cast process has not been used with nanoscale ceramic composites and Lu looks forward to creating new knowledge about nanocomposite systems. "Our long-term goal, after we create uniform materials, is to use them as structural and functional components," she said. "The advanced ceramic materials will be able to withstand sudden temperature changes without cracking and can also be used as a thermal shock shield. An important application could be electrostatic dissipation units, which are required to safeguard such sensitive electronic components as integrated circuits, hard disk drives, and circuit boards." Lu came to Virginia Tech in 2004. She was previously director of materials processing at the Center for Innovative Sintered Products at Pennsylvania State University and also was a materials development and processing scientist at Energizer Battery Company. She has extensive background in ceramic studies and built the first laser dilatometer for measuring dimensional changes and thermal expansion during sintering. She received her bachelor's from Tianjin University in China and both her master's and Ph.D. in from Ohio State University. 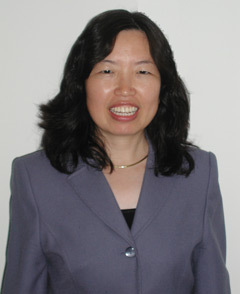 She is a member of Sigma Xi, the America Ceramic Society, Materials Research Society, and APMI International.